In the world of Transformers, two characters who have similar alternate modes are often set up as rivals. When Motormaster, the Stunticon leader, was introduced into the series, he was billed as always wanting to challenge Optimus Prime for the title of "King of the Road." Since Hasbro's current business strategy demands that every wave of Transformers include at least one Optimus, both Motormaster and he are represented in Combiner Wars with essentially the same toy. Don't let the shared mold turn you away, the new Voyager class Motormaster is one bad mothertrucker in his own right. 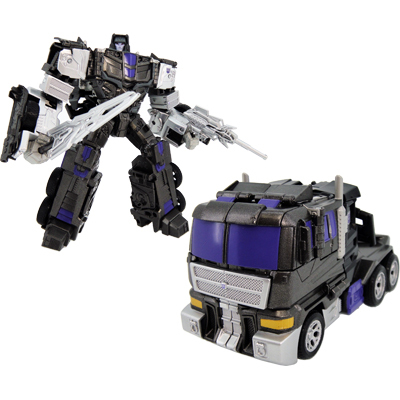 Check out my video review for both Motormaster and Menasor! This version of the Stunticon boss bot stands seven inches tall. While one can pick out some obvious Prime-specific design cues, Motormaster features a redesigned chest, shoulders, biceps, and head that transform the silhouette of a heroic Autobot into a fitting image of the Decepticon heavy. One thing I do wish had been changed is the obvious Optimus legs that Motormaster attempts to pass off as his own. This would have required a lot of remolding, so I can understand why Hasbro and TakaraTomy didn't go this route. At the very least, I think painting the taillights up to look like the truck cab feet Motormaster had in his G1 days might have helped them stand out a bit more. His back also features a redesigned chest plate for Motormaster's torso mode. The combiner's groin plate affixes itself to a pair of tabs on the backpack to stay neatly out of the way. What really brings the toy's look all together is the cartoon inspired block head that is adorned with a purple scowling face. One odd color choice is that this Motormaster's eyes are black instead of dark purple. Like his underlings, Motormaster has a full suite of articulation and even manages to surpass Combiner Wars Silverbolt by having a waist joint. His hips are universal joints with ratcheting on both axes. Likewise, his shoulders sound off with some heavy clicking, but only when moved in the outward direction. Also, he has thigh swivels which are used in his transformation to torso mode. Motormaster's own legs serve as Menasor's shins so the tightness of his hips is important. One leg is a bit looser than the other on my figure, but it's not enough to endanger the stability of the combiner. The Stunticon leader looks properly imposing next to his underlings. Despite some changes to the team, this is undeniably the Decepticon brute squad. For weapons, Motormaster comes with a movie-esque redesign of his usual silver sword. It's meant more for Menasor, but can still fit the lone Decepticon's hands so long as you push it down far enough. The sword can be split into a gun and smaller blade. The top part is keyed to only go in one way so you'll always reassemble it correctly. Honestly, I think the base of the sword passes itself off as a decent looking sci-fi alien blaster. And Motormaster can pull off some great intimidating poses where having a gun in hand adds to the status as a Decepticon mid-boss. While I am not too keen on the small sword, Motormaster can still use it effectively to stab some Auto-fools. Before tackling Menasor, I will focus on Motormaster's vehicle mode. His transformation is a variation on the classic Optimus Prime design, which is to be expected since the two share a mold. Motormaster's own head hides from view as it flips around on a rotating plate. A pair of flip up wind deflectors add to his silhouette while also differentiating the Stunticon from Optimus. While he is no longer the entire tractor-trailer, Motormaster still makes for a solid looking truck. He looks like the kind of evil vehicle that would be menacing Emilio Estevez and friends in a schlocky horror movie. Looking at the front of the truck, I start to feel the sting of Hasbro's reduced paint budget, as a lot of little things are left as bare plastic. Without these details, the toy looks unfinished. One neat thing about Motormaster is that he has a tiny Decepticon symbol in the middle of his grill. As he is otherwise devoid of faction symbols in truck mode, this is a nice and subtle way to show his allegiance. Sadly the paint work isn't quite matched between the two halves of the truck mode. It looks like something didn't dry correctly on the grate detailing. And speaking of paint, the American Motormaster really needed some extra touches like painted rims and all of its windows colored in. The Japanese Unite Warriors Motormaster has all that and is colored dark gray so he matches the cab from his G1 toy rather than the trailer. The two parts of the sword can be tabbed together and attached to the faux trailer hitch on the back of Motormaster's truck mode. There are also a pair of holes further back that can carry the sword. I assume this is more something Optimus uses as Motormaster's accessories just barely fit in this position. As a side note, I hope some kind of trailer gets made for this figure because deep down I am ten years old and want to carry a bunch of toy cars around with a truck. Once all the Stunticons are gathered, they can now combine to form Menasor! Start by hiding Motormaster's head like in truck mode. Next, fold up his arms and swivel his lower legs so that Motormaster's own feet are pointing sideways. Then you attach whichever limb bots you choose as Menasor's shins and feet. Motormaster's upper torso spins around and his fists flip up to reveal combiner ports for his arms. The upper torso unfolds to allow Menasor's head to emerge. Another part flips down to form a groin plate that beefs up the look of his waist. The completed Menasor is around a foot tall and makes for a beefy update on the somewhat diminutive G1 combiner. By default, the two flip out panels from Motormaster's own inner calves tab into his thighs to form the upper legs of Menasor. While this is more accurate to the old toy, I think it makes him look a bit too bowlegged. Also, you can fiddle around with the other Stunticons to make a more G1-esque Menasor with more continuous looking arms and shins where the leg bots' chests are facing front. Doing this will sacrifice most of his articulation, which in a way brings it closer to the 80's version. For the rest of my review, I will be presenting Menasor with this popular fan transformation where Motormaster's shins are left separate from his thighs so you can straighten out his legs and make Menasor look taller and leaner. This has the added bonus of allowing the combined figure to use Motormaster's thigh swivels as his own, which aids the toy in doing much more natural looking poses. Despite the way he's formed, Menasor looks surprisingly cohesive from just about every angle. And while his feet may look small, the thumbs-turned-heel-struts make him quite stable. Also, I like to flip Motormaster's fists back down over the shoulder combiner ports to make his body a bit more solid looking. The hands can also be covered by the wind deflectors so they are hidden in a front view. Menasor's neck consists of a double ball-joint, which lets his head tilt around a bit to add to his ogre-like appearance. I know the combined form's face design is somewhat divisive among fans, but I think in-hand it looks like a properly angry robot monster. You may have noticed that I added a repro label Decepticon symbol to Menasor's chest as the stock toy does not have one visible from the front in combiner mode. The Unite Warriors Motormaster fixes this by adding a tampographed symbol split across the opening chest panels. Inside his chest plate is some weird alien detailing that apparently is an homage to Age of Extinction Galvatron. This is where Decepticon Blackjack can plug in like the roller car from G1 Menasor but I have not acquired one at the time of this review. Fellow reviewer, StarSaber, covered Blackjack in a separate review. I will amend my own once I get him, but for now I feel like Blackjack is not a necessary addition to Menasor. Menasor's range of motion actually manages to exceed any of his individual components as he adds wrist and ankle joints to the usual suite of articulation. And he manages to have a functional waist joint unlike his Autobot rival, Superion. While he does lack ankle tilts, it is possible to maneuver the parts of the feet used for hand mode to cheat some more poses out of him. Admittedly, my smooth vinyl flooring backdrop makes doing this more difficult than it would be on, say, a carpet or couch. Menasor can even bring his hands together to intimidated his foes with some mechanical knuckle cracking. Best of all, his completely unhindered hip joints allow the entire combiner to kneel down. And Menasor can of course wield Motormaster's silver sword as his own weapon. With Motormaster's hands in my preferred position, they can be used to store the sword on Menasor's back. Also, the side panels from the Stunticon leader's truck mode can be used to better hide his own chest so it isn't a visible part of Menasor's back. Another handy feature is that all of the limb bots can store their individual weapons without interfering with the combined mode. And in the true spirit of Scramble City, any of the deluxe class Combiner Wars figures can be used to form Menasor. Here is Alpha Bravo being used to "arm" the Decepticon giant. The big guy looks plenty menacing no matter how his limbs are configured. On his own, Motormaster is another enjoyable Combiner Wars figure who doesn't feel compromised by the need to turn into both a truck and a torso. Despite being derived from an Optimus Prime toy, I feel that this version is in many ways the definitive use of the mold. All of the unique parts that make it into Motormaster work far better for an evil truck boss than a heroic Autobot leader. And honestly, my only complaint about this particular release are the uncolored details in truck mode. When compared to the upcoming Unite Warriors Menasor set, it can be hard to brush off the results of Hasbro's tighter paint budget. That being said, I am still quite happy with my Motormaster. After completing my first Combiner Wars team, I am still just as excited as when I first heard news about this new direction for the Transformers toy line. As a kid, I always enjoyed playing with my Scramble City guys and I feel like Hasbro and TakaraTomy have really nailed it with this modernized take on the concept. While Motormaster and his underlings are not perfect, each one is a sturdy figure that is designed to be a fun, playable kid's' toy. Simply put, Combiner Wars are the kind of Transformers that are engaging no matter what I am doing with them. Whether converting team members between modes, combining them, or taking them apart again, the whole experience captures the spirit of what I love about Transformers. I am definitely looking forward to many more Combiner Wars figures to come. It's great to see that the new official Stunticons have turned out so well. I suspect Combiner Wars may be more of a place holder until the next live-action movie hits, but I'm curious to see how far Hasbro and Takara will take this. Will we see new takes on the Predacons, Technobots, Trainbots, Terrorcons, or Seacons? Pretender Monsters? Multiforce? Dinoforce? Brainmasters? Breastforce? All things that could and perhaps should happen. There's a third party Motormaster coming out called Lone Wolf. It doesn't come with new fists and feet, and I'm wondering if they'll release a trailer with that function. My Menasor is from the UW boxset and I'm very afraid of breaking his hip joints since they are so tight and whatnot. I have to apply some force in order to get them move sideways. Is this a common problem? If you loosen the screw on the hips, they should move better.